Early California Art lovers are looking forward to “Art in the Adobes”, a unique event taking place in downtown Monterey September 30th through October 2nd. During the weekend, a number of important paintings by a variety of Early Monterey artists will be on view. The title of the Exhibition is “Hidden Treasures from Old Monterey”, since many of the paintings have rarely been seen by the public until now. The exhibition focuses on local artists from the Monterey area who worked during the late 18th century and early 19th century. The works will be displayed simultaneously in a number of historic venues, including the Stevenson House, The Cooper-Molera Adobe, and ColtonHall, site of the 1849 California Convention. Note: Images posted in this blog are NOT paintings that will be on display at this event (those will remain “hidden” until the Festival begins on the 30th). Images seen in this post are paintings by artists represented at the event, and several of the works are currently available to interested collectors through Karges Fine Art. Paintings that will be on display during Art at the Adobes include works by noted marine artist Armin Hansen, Charles Rollo Peters, and Mary DeNeale Morgan. Armin Hansen settled in the Monterey area in 1913, and was one of the founders of the Carmel Art Association. One of his oversize masterpieces will be on view at Casa Serrano during the Festival. He is best remembered for his dramatic depictions of coastal scenes, boats, and local fishermen. 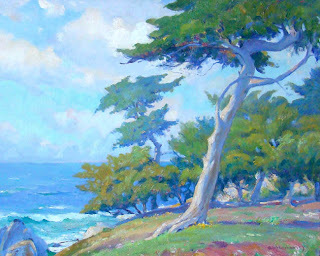 Mary DeNeale Morgan settled in Carmel in 1909, and attended summer art classes that were led by William Merritt Chase. She later became the director of the Carmel School of Art from 1917-1925. On Sunday, October 2nd, 2011, Lila Staples, Chair of the Visual and Public Art Department at California State University Monterey Bay, will present a lecture and slide discussion focusing on women artists of Monterey’s early years. For additional information about other lectures scheduled throughout the weekend, click here. Scott Shields, Chief Curator of the Crocker Art Museum, will be on hand Saturday October 1st at Monterey City Hall with a lecture titled “When Monterey was Modern: The Peninsula’s Early Art Colony and its Place in California Art”. 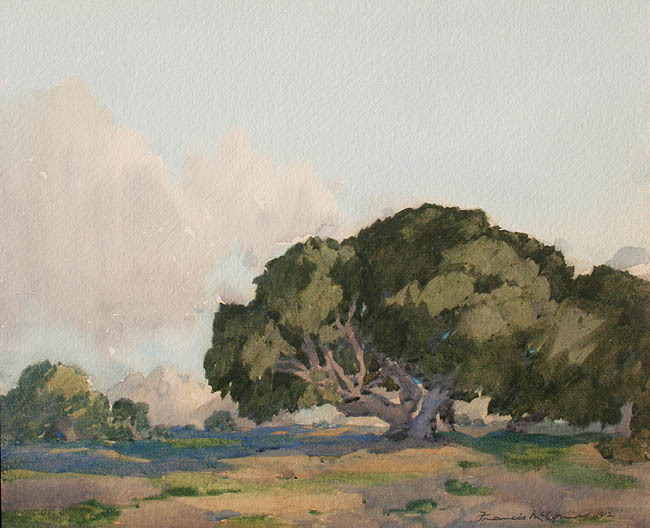 Works by Christian Jorgensen (1860 – 1935) will be on display at the Cooper-Molera Adobe, a National Historic Trust site. 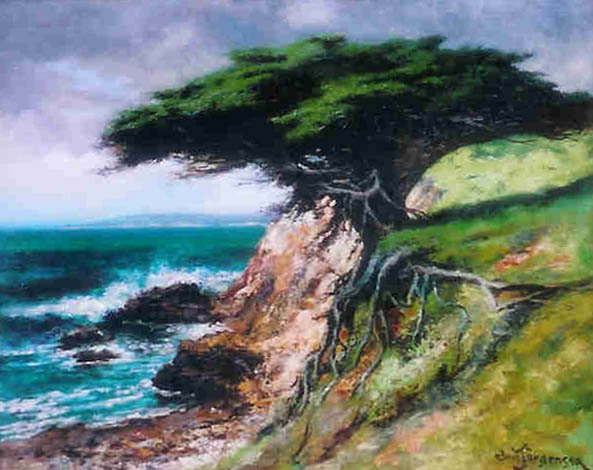 He is best remembered for his intricately detailed coastal scenes featuring the distinctive local Cypress trees. In 1905 he and his wife Angela built a boulder home in Carmel, which later became the Hotel La Playa. 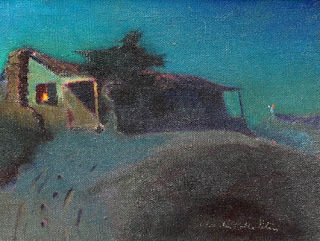 Charles Rollo Peters, known for his quiet, contemplative nocturnes, will also be represented at the event. The MontereyMuseum of Art will mount a special display of important paintings on loan, and the StevensonHouse will also provide a temporary home to paintings by Peters and his second wife, Constance Evans Easley Peters. The Monterey Public library will have paintings on display by local artists Arthur Hill Gilbert, Francis McComas, and Abel Warshawsky. 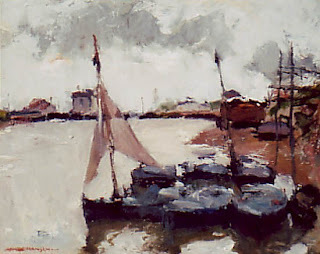 Francis McComas, noted for his delicate watercolors, studied with Arthur Mathews (a central figure in the San Francisco Bay Area art scene) at the Mark Hopkins Institute in San Francisco at the turn of the century. You can find more like these awesome works at these California Art Galleries. 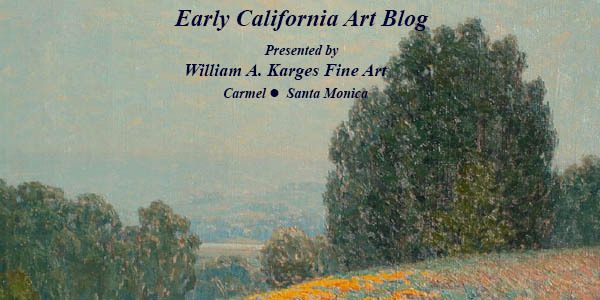 Yes, this website is always a great resource for lovers of Early California Art! I have tow paintings of early Caifornia adobes by Virginia Reifer. How can I find out more about her and her works or the value of these paintings? I apologize for the delay in responding to your question. The Director of our gallery, William A. Karges Fine Art, would be happy to take a look at your paintings if you could email photos to him at gallery@kargesfineart.com We look forward to helping you with an evaluation of your paintings.